Ah, crispy potato cubes served with a spicy tomato sauce – what’s not to like about the Spanish version of chips?! Patatas bravas are perfect for sharing, so they’re a staple at any tapas bar. The raw potato cubes are usually fried in lots and lots of olive oil until crisp on the outside and fluffy on the inside. I prefer to roast mine, as this reduces the oil a bit and also allows me time to focus on my sauce while the potatoes are in the oven. 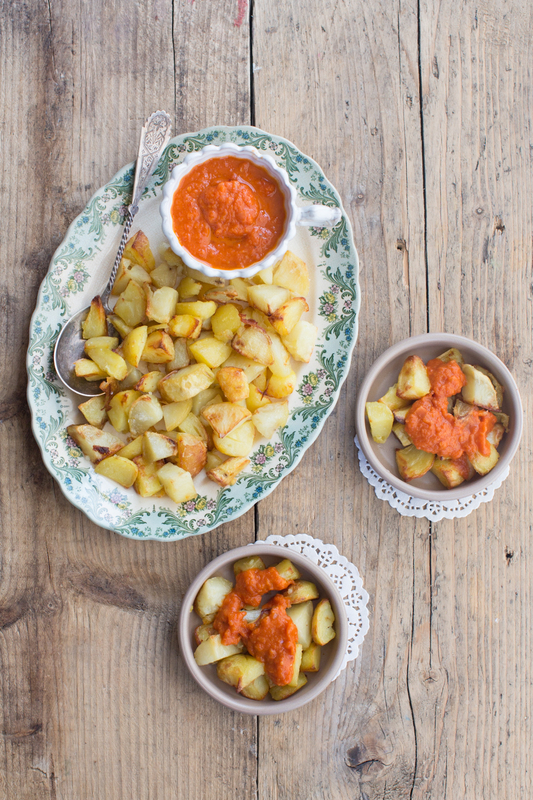 You can watch me make these patatas bravas in my Barcelona tapas episode. Peel the potatoes and cut into rough 2cm cubes. Put a roasting tray with 4 tablespoons of olive oil into the oven and leave to heat for 5 minutes, then take out, toss the potatoes in the hot oil and season with salt. Bake for about 45 minutes until crisp and golden, turning them after every 10 minutes. Midway through the baking, after about 20 minutes, take out the tin out, give the potatoes a shake and drizzle with the remaining 2 tablespoons of olive oil. While the potatoes are baking, prepare the sauce: finely chop the onion and fry in a saucepan with one tablespoon of olive oil for 5 minutes. Peel and crush the garlic clove, add to the onions and fry for another minute. Add the sherry and wait for it to bubble. Then add the chopped tomatoes, the chili flakes, smoked paprika, red wine vinegar, sugar and salt. Bring to the boil, then reduce the heat and simmer for 10 minutes, until it forms a thick sauce. Take off the heat and blend with a hand blender until smooth. 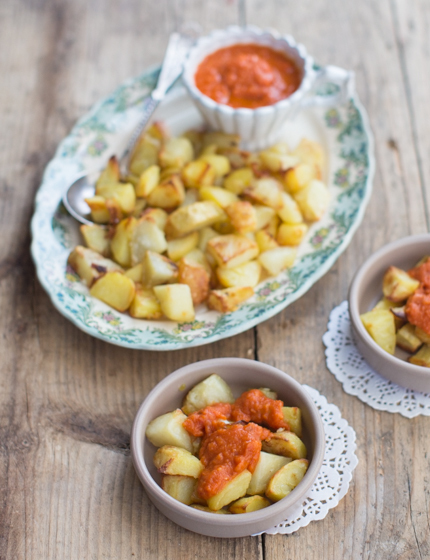 Serve the patatas bravas drizzled with tomato sauce. • If you have any leftover sauce, you can make amazing baked eggs the next day for breakfast: put a generous tablespoon of sauce into a ramequin, top with a teaspoon of crème fraîche, crack an egg on top, and season with salt and pepper. Place the ramequin into a baking dish, half-filled with water and bake in a 180°C oven for 12 minutes. • To be honest, the potatoes taste even better the next day as they become more crispy when twice-baked… Put any leftovers into a roasting tin and drizzle with a bit of olive oil. Put into a 180°C oven for about 20 minutes until they’ve crispened up. 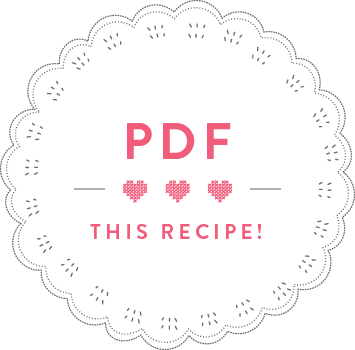 • This sauce also tastes really nice with grilled fish or meat. These look so good. I love spanish food so will definitely have to try these out!